I INTellIgeNce www.vanguardcanada.com FEBRUARY/MARCH 2015 45 For more information about the CASIS Symposium on January 23, 2015, please see www.casis-acers.ca tacks a day – that many organizations have adopted a "no downloads" rule. Joan DeBardeleben of Carleton Uni- versity looked at Russian geopolitical at- titudes from the Russian perspective (but not endorsing it). Russia feels deeply the loss of its former influence, and resents what it sees as inroads up to its current borders from NATO and the EU. Under President Putin post-Soviet Russia has moved to a more ideological and proac- tive stance, less oriented to Europe, with more emphasis on military power. 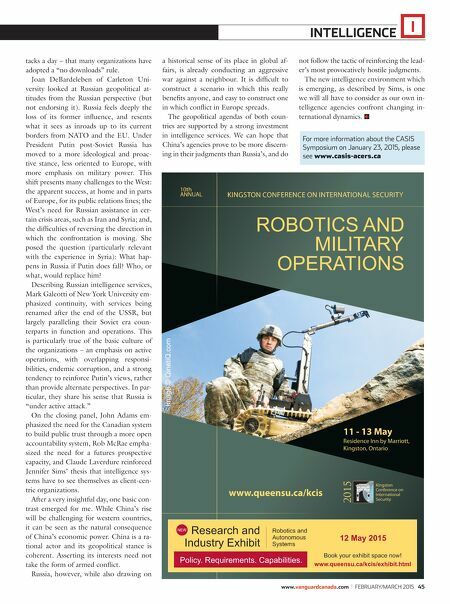 This shift presents many challenges to the West: the apparent success, at home and in parts of Europe, for its public relations lines; the West's need for Russian assistance in cer- tain crisis areas, such as Iran and Syria; and, the difficulties of reversing the direction in which the confrontation is moving. She posed the question (particularly relevant with the experience in Syria): What hap- pens in Russia if Putin does fall? Who, or what, would replace him? Describing Russian intelligence services, Mark Galeotti of New York University em- phasized continuity, with services being renamed after the end of the USSR, but largely paralleling their Soviet era coun- terparts in function and operations. This is particularly true of the basic culture of the organizations – an emphasis on active operations, with overlapping responsi- bilities, endemic corruption, and a strong tendency to reinforce Putin's views, rather than provide alternate perspectives. In par- ticular, they share his sense that Russia is "under active attack." On the closing panel, John Adams em- phasized the need for the Canadian system to build public trust through a more open accountability system, Rob McRae empha- sized the need for a futures prospective capacity, and Claude Laverdure reinforced Jennifer Sims' thesis that intelligence sys- tems have to see themselves as client-cen- tric organizations. After a very insightful day, one basic con- trast emerged for me. While China's rise will be challenging for western countries, it can be seen as the natural consequence of China's economic power. China is a ra- tional actor and its geopolitical stance is coherent. Asserting its interests need not take the form of armed conflict. Russia, however, while also drawing on a historical sense of its place in global af- fairs, is already conducting an aggressive war against a neighbour. It is difficult to construct a scenario in which this really benefits anyone, and easy to construct one in which conflict in Europe spreads. The geopolitical agendas of both coun- tries are supported by a strong investment in intelligence services. We can hope that China's agencies prove to be more discern- ing in their judgments than Russia's, and do not follow the tactic of reinforcing the lead- er's most provocatively hostile judgments. 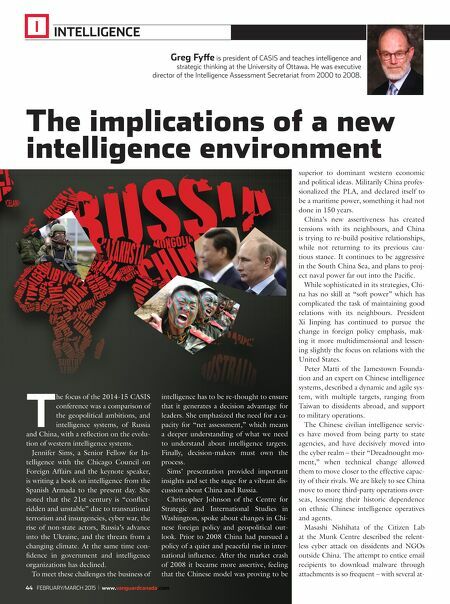 The new intelligence environment which is emerging, as described by Sims, is one we will all have to consider as our own in- telligence agencies confront changing in- ternational dynamics.